As I explained in “The Social Security Bust Fund”, the federal government has summarily confiscated and spent every dime of the $2.6 trillion surplus, which would have comprised the Social Security Trust Fund, and has replaced it with non-marketable, special-issue, Treasury securities. Since these special-issue securities are an asset to the Trust Fund and a liability to the U.S. Treasury, they therefore cancel each other out and, according to Note 14, “are eliminated in the consolidation of these financial statements”. However, as we shall see later, they actually do appear on the financial statements and are detailed in Note 24. During any fiscal year, when a trust fund’s disbursements exceed its receipts, then these special-issue securities require redemption. Note 24 warns us that, “Redeeming these securities will increase the Government’s financing needs and require more borrowing from the public (or less repayment of debt), or will result in higher taxes than otherwise would have been needed, or less spending on other programs than otherwise would have occurred, or some combination thereof.” Since less repayment of debt is a non-issue, the only options the government has in order to pay back what it has stolen from the Trust Fund are to borrow more from the public (i.e. increase the debt ceiling indefinitely), raise taxes, or cut spending on other programs. In effect, there is no Trust Fund. The total amount of Social Security taxes collected within each fiscal year is spent on that year’s benefit payments. If the total receipts exceed the amount of benefit payments, then the surplus is taken by the Treasury and spent on general expenses. However, if the amount of benefit payments exceeds receipts, such as happened in 2010, then the Treasury must borrow more from the public in order to reimburse the Trust Fund. In the fiscal year ended September 30, 2010, the government collected a total of $552.8 billion in Social Security taxes, and paid out $574.9 billion in benefits. The difference was made up by the Treasury paying out some of the accrued interest that it owes on past borrowings. Of course, the interest which was paid out had to be borrowed from the public because, the government has been running trillion-dollar plus budget deficits for the past two years. You should review the financial statements of the United States Government for the fiscal year ended September 30, 2010 for yourself, and draw your own conclusions. I have and I am sad to report that the Social Security Trust Fund is nothing more than an empty promise. Let’s check the balance sheet. 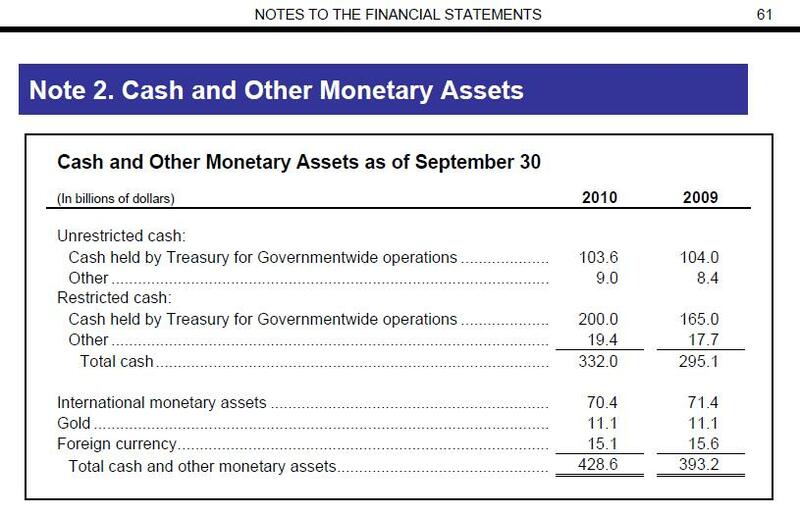 Among the government’s assets, only $428.6 billion was classified as “cash and other monetary assets”. Digging down into Note 2 of the financial statements, we discovered that the actual amount of cash was just $332.0 billion. 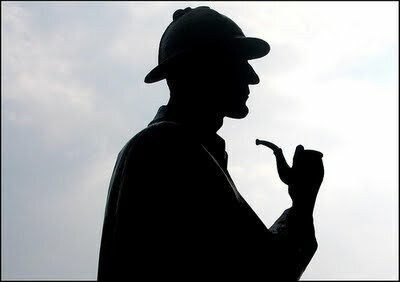 Further, we discovered that out of this $332.0 billion, only $112.6 billion (103.6 + 9.0) was actually “unrestricted”, meaning available for use on government operating expenses. The remainder, which was listed as “restricted”, included $200 billion which was held by the Federal Reserve in the Supplementary Financing Program (SFP*), $18.6 billion held by the Foreign Military Sales program, and another $0.8 billion which was curiously omitted from explanation. The other monetary assets listed were International Monetary Assets of $70.4 billion, Gold of $11.1 billion, and Foreign Currency of $15.1 billion. (It’s interesting to note that the government owns 261,498,900 troy ounces of gold, and that its book value is listed at $11.1 billion, or at the statutory value of just $42.22 per ounce. If valued at the fair market value of $1,307 per troy ounce on 9/30/2010, then the value would actually have been $341.8 billion.) A detailed explanation of cash and other monetary assets may be found in the narrative section of Note 2. Where is the Social Security Trust Fund shown on the government’s financial statements? 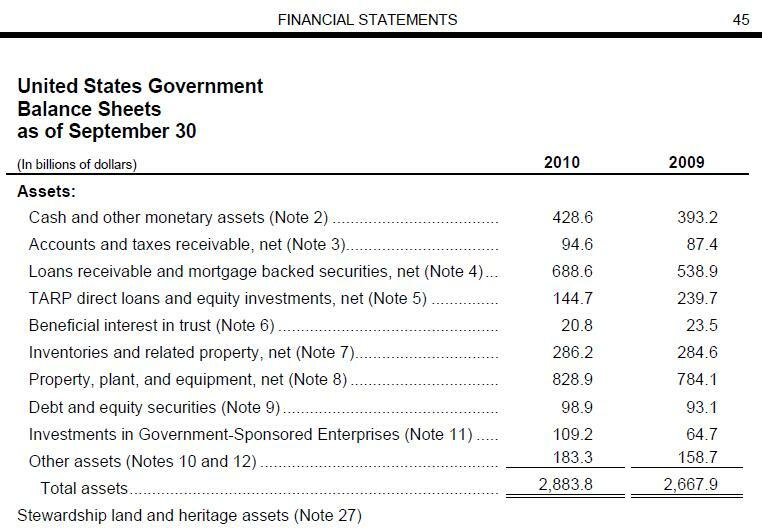 As you should understand by now, the government borrowed and spent all of the money and owes it back to the Trust Fund, however, you won’t find an entry matching $2.6 trillion on the balance sheet. Per Note 14, “Intragovernmental debt holdings represent the portion of the gross Federal debt held as investments by Government entities such as trust funds, revolving funds, and special funds. This includes trust funds that are earmarked funds. For more information on earmarked funds, see Note 24─Earmarked Funds. 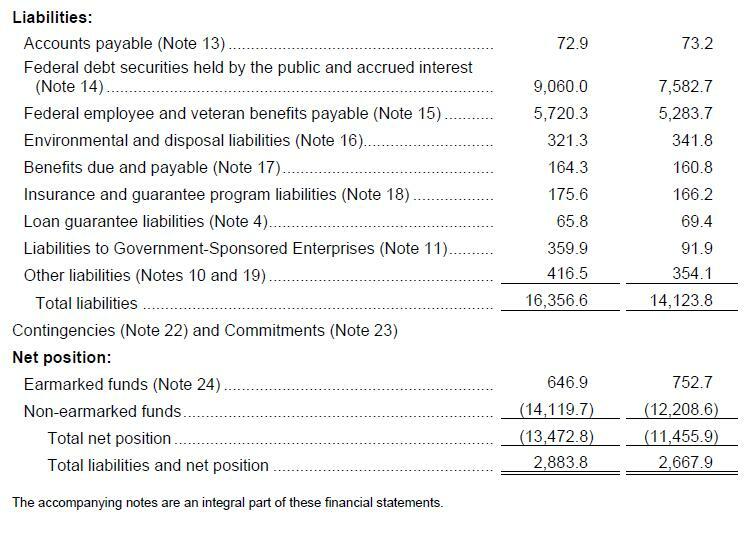 These intragovernmental debt holdings are eliminated in the consolidation of these financial statements.” However, the net amount of all of the government’s sacred trust funds does appear in the Net Position section as Earmarked Funds in the amount of $646.9 billion. What this means is that when all of the government’s various trust funds are netted together, the $2.6 trillion Social Security Trust Fund is reduced to a surplus of just $646.9 billion. I created the following condensed table based on the one shown in Note 24 (the original is too large to be shown here). 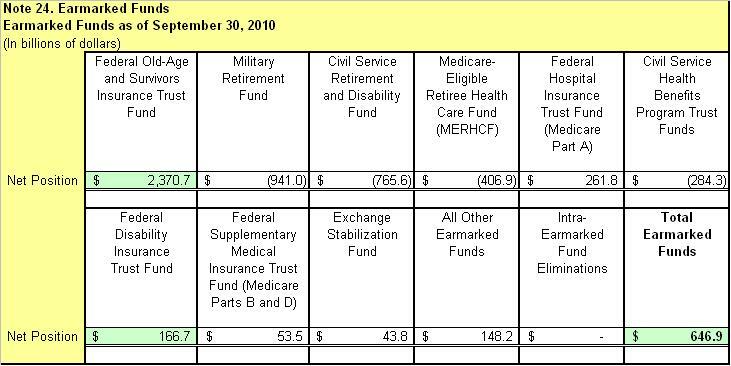 As you can see, when the $2.6 trillion surplus balances of the Federal Old-Age and Survivors Insurance Trust Fund, and the Federal Disability Insurance Trust Fund are netted against a $941.0 billion deficit in the Military Retirement Fund, a $765.6 billion deficit in the Civil Service Retirement and Disability Fund, a $406.9 billion deficit in the Medicare-Eligible Retiree Health Care Fund, and the rest of the trust funds, the net balance is just $646.9 billion. This is shown as the amount of “Earmarked Funds” which the government owes to itself out of its $14.1 trillion of accumulated deficits. In financial terms, the federal government has accumulated losses of $14.1 trillion since its inception. It may also be the only entity on earth with the audacity to proclaim that the $2.6 trillion, which it borrowed from funds which were supposed to have been held in trust, is somehow secured by its $14.1 trillion in accumulated losses. In reality, both the Federal Government, and the Social Security Trust Fund are insolvent. In conclusion, the only options that the government has of recovering the $2.6 trillion surplus, which our generation has dutifully paid into Social Security, are to either; (1) borrow more money from the public, (2) increase taxes, or (3) reduce spending on other programs. Borrowing more from the public, in order to pay back that which has already been borrowed from the government, could put the nation’s credit rating at risk, thus jeopardizing not only Social Security, but our National Security. Increasing taxes on the public in order to make up for what we have already paid in taxes, which should have been set aside for our welfare instead of having been squandered, is not acceptable. The only viable option is for the federal government to fundamentally restructure, privatize, or discontinue every governmental agency, program, subsidy, enterprise, and special project which does not take in more money than it spends. This includes all Government Sponsored Enterprises, the Postal Service, and Amtrak. If it’s not making money, then it must either be restructured in a way so as to become profitable, sold to the private sector, or terminated. After that comes the selling off of government owned property, plant and equipment, gold and any other non-productive asset held by the federal government.